Once raised to defend a doomed Scottish queen, the Cameron sword lies hidden, guarded by a deadly curse. Only the bravest dare seek the fabled blade – and the rare treasure it contains. A British earl with gypsy blood, in his wild youth rugged Alexei Cameron shared an extraordinary night with a beautiful stranger who vanished with the dawn. Now she is back in his life – bound to him in a chilling mission. A tour guide at beautiful Draycott Abbey and an expert on ancient weaponry, Joanna Russell had good reasons for abandoning Alex after their unforgettable night of passion. But she must forget her haunted past to solve the puzzle of the lost Cameron sword – confronting dark secrets and an enemy who knows too much. 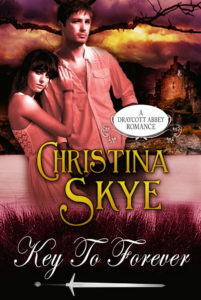 To find their treasure, Alex and Joanna must fulfill their destiny, set centuries before. For the key to an ancient mystery lies in a passion reborn…and in a haunting love too long denied.